STOP PRESS! 30 April 2008 - HILLBILLY HEAVEN are nominated for the first time in the SLIM DUSTY COUNTRY GROUP category of the 32nd Australian Entertainment 'MO' Awards, alongside Buckshot, The Flood, The McClymonts and The Wolverines. The line-up of HILLBILLY HEAVEN includes BOB HOWE (guitar, harmonica, vocals, musical director), ALLAN TOMKINS (bass, vocals, instrument making), TERRY PHILLPOT (drums and commentary), DOUG BOYD (piano, squeeeeeze box), and TOMI GRASO (pedal steel guitar extraordinaire). The earliest documented version of the band was in 1990, but the current line-up was hand-picked to be the 'House Band' for the monthly Canterbury Country shows, hosted in Sydney by Bob Howe since the year 2000. 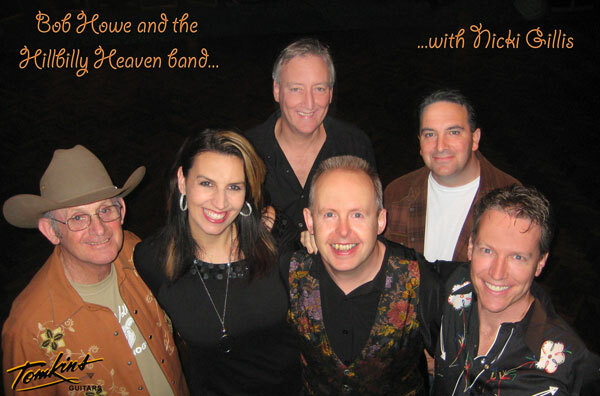 The band is pictured above in 2008 with NICKI GILLIS who regularly joins the boys to co-host Canterbury Country as featured vocalist, playing acoustic guitar and mandolin - (left to right) Allan, Nicki, Terry, Bob, Tomi, Doug. All the members of HILLBILLY HEAVEN have a distinguished pedigree in the realm of Australian Country Music. Together, they bring a wealth of experience to each and every show. Heaven, Country style!